Having not gone to the bar on Thursday night, I managed to get up early enough to go for a run around a small nearby lake, Valkenberg Meer. 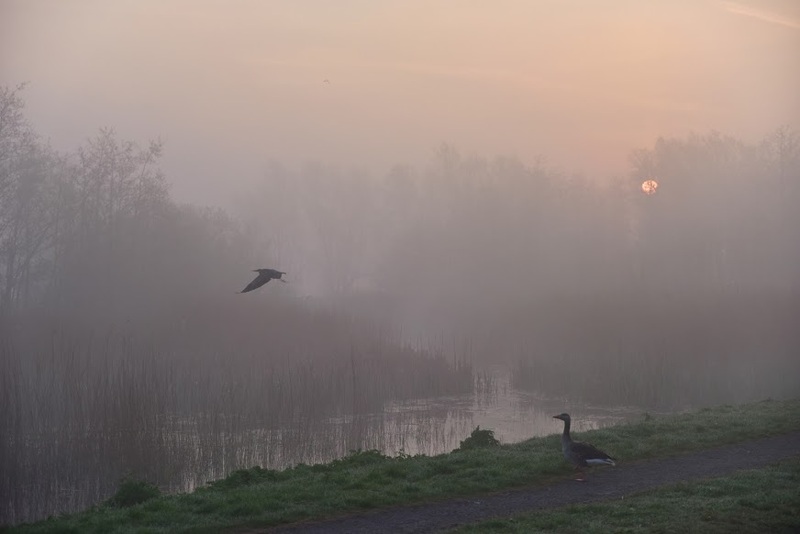 I met workshop attendee Peter Teuben as he was setting off on a bike ride; Peter took a beautiful photo of the lake in the early morning mist. Some more of Peter’s photos are here. The day started with contributed talks by Emilie Ishida (COIN), Matt Craig (astropy with undergrads), and Joe Zuntz (CosmoSIS). These were three very different talks, with Emilie discussing how to collaborate with statisticians, Matt how to use astropy for both teaching and research, and Joe talking about estimating cosmological parameters with the most enthusiasm I have ever seen on the subject. But all super-interesting! After coffee: Perry Greenfield of STScI gave an overview of the history and future of Python at the Space Telescopes Science Institute, which, to my knowledge, has been the largest institutional player in moving the use of Python into astronomy. The Storify is here. This talk was less technical and more historical/political than others, but I think was really useful for putting the whole workshop in context. Finally we had the last round of lightning talks, Storified here. These were not a planned part of the schedule but there were just so many things to share! We finished the morning with a general discussion of how to preserve the week’s work and move forward. Ideas for preserving the week’s work include having a repository of talk slides and a list of packages discussed as well as an “unproceedings” document which would summarize the unconference sessions and eventually go on arxiv like this one from dotastronomy. Lastly before lunch we did the conference picture. If we look like we’re all laughing it’s because of the hilarious dancing astronomer who just behind the photographer. But we really did have a good time. In addition to these, lots of people were working on coding for various projects in the afternoon. I mostly worked on documenting the meeting itself; I think this is important both for the people who were there and for the many people who wanted to come but couldn’t. The coding was still going strong when I left at about 1730, and from Twitter accounts, it carried on into the evening. In a few days I intend to reflect on the workshop and where I think the ‘Python in Astronomy’ community might be heading. My initial feeling is that this could be the start of a real change in how astronomical research is done, in a more open and collaborative way than before. It was an exciting week!